The US embassy in Ankara appeared anxious about its bilateral relations on Thursday, when it tweeted a photo of crowds greeting former US President Dwight Eisenhower in Turkey after seeing the warm welcome received by Russian Foreign Minister Sergey Lavrov on his visit to the country. After Russian Foreign Minister Sergey Lavrov was given a warm reception in Turkey's Alanya on Thursday, the US embassy responded by tweeting a historical photograph of Dwight Eisenhower's visit to Turkey, in an anxious reminder of the ties between Ankara and Washington. Arriving in the city of Alanya, in the province of Antalya, Lavrov's motorcade was greeted by cheering children and young people waving Turkish and Russian flags. One home on the route had even hung a huge poster across five floors, which depicted Lavrov and his Turkish counterpart Mevlut Cavusoglu shaking hands. The caption underneath quoted the Russian version of the Internationale socialist anthem, "The world is about to change its foundation." — Dr. Hasan TANRISEVEN (@hasantanriseven) 1 декабря 2016 г. ​An hour after the meeting, Twitter user Hasan Tanriseven published photographs of the enthusiastic reception for Lavrov's visit. — US Embassy Turkey (@USEmbassyTurkey) 1 декабря 2016 г. ​Less than an hour later, the US embassy had seen and responded to the photos. Apparently eager to remind followers about the long-standing relationship between Ankara and Washington, the embassy tweeted a photo of a crowd greeting Dwight Eisenhower on a visit to Ankara in 1959, with the US and Turkish flags accentuated in color. 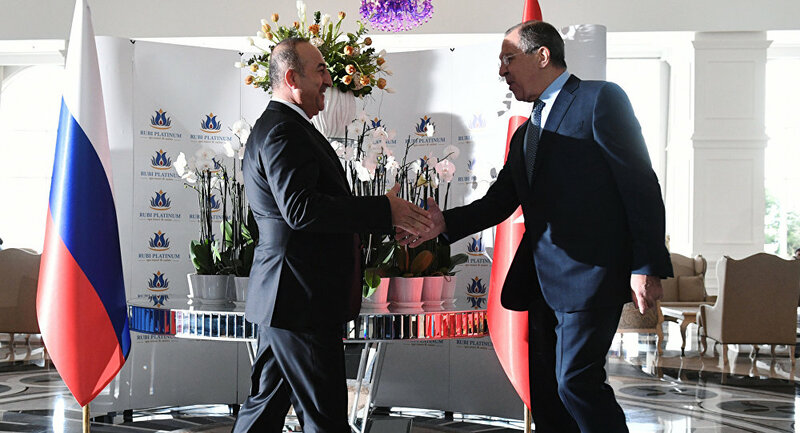 At their meeting on Thursday, Lavrov and Cavusoglu discussed bilateral relations, including preparations for the upcoming High-Level Russian-Turkish Cooperation Council meeting that will be attended by the leaders of both countries early next year. They also talked about the construction of the Akkuyu Nuclear Power Plant, in collaboration with Russia's Rosatom. — Adem Murat Yücel (@AdemMuratYucel) 1 декабря 2016 г.
Tweets of Lavrov's visit by the mayor of Alanya Adem Murat Yucel. ​The foreign ministers also discussed Libya, Iraq, Yemen and the Syrian conflict. They expressed readiness to co-operate in the fight against terrorism, and in reaching a political settlement to the crisis in Syria. "We had a very useful discussion about a very wide range of questions, paying particular attention to acute international issues, particularly the situation in Syria. We were united in our understanding that it is necessary, as soon as possible, to stop the terrorist threat in that country, stop the bloodshed, enable the process of regulation through political channels and provide a solution to humanitarian problems and aid delivery," Lavrov said after talks with Cavusoglu.